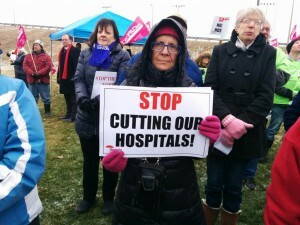 On Monday, the Northeastern Ontario Day of Action, organized by the Ontario Health Coalition and the North Bay Health Coalition, brought together patients, seniors, health advocates, hospital workers and local citizens to address the devastating hospital cuts that are affecting Northern Ontario towns. 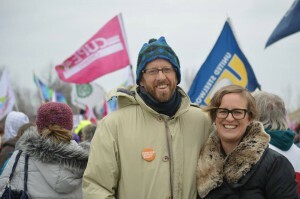 With the attendance of 1000 people all speaking in unity, the rally sent a strong message to Ontario’s government: the hospital cuts have gone too far; they need to be stopped and services restored to meet our communities’ needs. 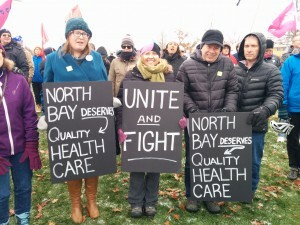 “Access to health care should not depend on the size of your wallet,” said Sara Labelle, an Executive Board Member of OPSEU, speaking from the stage framed by North Bay’s “Gateway to the North” sign. Services cut from local hospitals are privatized to for-profit clinics that only take the easiest patients, leaving heavier care patients behind with fewer resources, less funding and less staff in local hospitals, she told the crowd. 56 beds in Sault Ste. 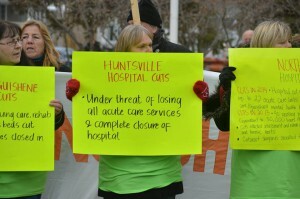 Marie; 36 complex continuing care, rehab and palliative care beds in Midland/Penetanguishene on top of all inpatient hospital services being closed in Penetanguishene; 10% of the workforce and 50% of operating room time at risk of being cut in Timiskaming; an threat to completely close the Huntsville hospital or close the operating rooms. Ontario has now fallen to last place in terms of hospital funding in Canada. Addressing this, CUPE National President Mark Hancock asked, “Is there any reason why Manitoba, Saskatchewan, and British Columbia should have better hospital services than Ontario?”, to which the crowd responded with a resounding no. Gathered under the Gateway Arch at Lee Park, Michael Taylor, who is a caregiver for his two elderly parents and co-chair of the North Bay Health Coalition roused and led the crowd in chants, calling “Stop the cuts!”. At times, the honks of support from the traffic passing by was so loud, the speakers could barely be heard. “North Bay is losing dozens of hospital services and more than a hundred front-line staff,” Natalie Mehra, Executive Director of the Ontario Health Coalition, said to the crowd, adding, “It can’t go on any longer.” She called upon the Ontario provincial government to restore hospital funding so that services and beds can be re-opened and the crisis of access to health care in the north be addressed. 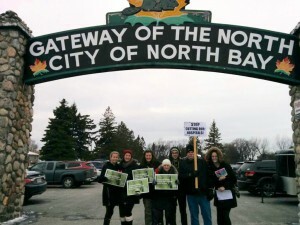 Congratulations on a terrific turnout North Bay and Northeastern Ontario! Thank you for the fantastic work of the North Bay Health Coalition and all of you across the region who worked to make this happen.